NEWA now (1) will save your apple biofix dates, (2) has a button to click out of apple biofix dates that are too early, and (3) provides the full interface for apple pest forecast tools accessed from the Station Pages. You may need to clear your browser’s cache to enable local storage and see these changes. Tired of entering green tip dates, bloom dates, etc., over and over again? We’re now caching that! The apple diseases, apple carbohydrate thinning, and apple irrigation tools on NEWA will now save the green tip date, first blossom open date, orchard blight history selection, bloom date, petal fall date, trees per acre, and age of orchard, that you entered when last using the tool. The dates and orchard characteristics cached are specific to the weather station location and the year used. The information saved is what you last entered when using the tool for that weather station and year. This information is saved locally in your browser’s cache. Local storage from your browser is not backed up, so if it is cleared (deleted), it will need to be reentered. Always keep a record of your biofix dates and orchard characteristics. We developed an Apple Biofix Record Sheet to help growers keep track of the apple disease and insect biofix information. Feel free to adapt this to benefit your operation and use of NEWA tools. Is the NEWA-estimated biofix date too early and you want to eliminate it? Now you can! On the Apple Diseases tools for apple scab (green tip date), fire blight (first blossom open date) and sooty blotch/flyspeck (90% petal fall date) a “Click if <biofix> has not occurred” button returns you to the pre-biofix IPM information for that apple disease tool. Screen shots of the new button that can be used if biofix has not yet occurred. (A) For apple scab green tip. (B) For fire blight. (C) For sooty blotch/flyspeck. This is especially important for locations south of New York where apple phenology can be estimated incorrectly from the historical data collected at Cornell AgriTech at NYSAES, Geneva, NY. In particular, for fire blight, the pre-biofix IPM message contains fundamental information about scouting for oozing, overwintering fire blight cankers. For apple scab, the pre-biofix message informs you about the upcoming primary infection season. Do you want to see what happened last year or change the biofix date on an apple disease or insect tool when accessing it from a Station Page? Now you can! Previously, the Station Page Pest Forecasts for apple diseases (apple scab, fire blight, sooty blotch/flyspeck) and insects (spotted tentiform leafminer, oriental fruit moth, codling moth, plum curculio, obliquebanded leafroller, apple maggot) provided current day results only. Now, those links will take you to the current day results in the fully functional interface, including the map, results, and more info tabs. The left-hand part of that interface allows you to select dates in the past to look at what the tool predicted for last year or prior years. You also can select an alternate weather station location and see the map of weather stations. A link below the model results will return you to the Station Page for the weather station of interest. Screen shot of the NEWA fire blight tool accessed from the Geneva Station Page. The full interface has the Map, Results, and More Info tabs and the left-hand selection tools to access different dates and locations. Return to the Station Page using the link at the bottom of the web page display. Most of these upgrades are operational on the NEWA server now. Finalizing the local cache to save the orchard characteristics for the apple carbohydrate thinning model and the apple irrigation model will be operational by Monday, April 2, 2018. This entry was posted in about models, apples, information, news on March 27, 2018 by jec3@cornell.edu. Weather stations occasionally use substituted data for quality control purposes. This article describes why and how. 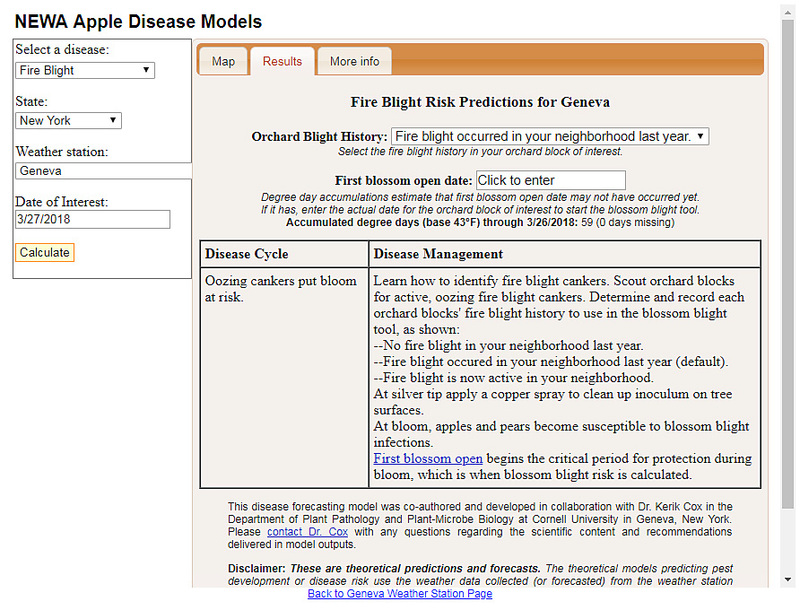 NEWA models need continuous data to provide accurate insect and plant disease risk forecasts. To ensure this continuity, an existing weather station is paired with each new location as a backup data source. Paired data sources are useful when a station is out for extended periods of time for maintenance or calibration. When an instrument is out, onsite conditions are lost unless information from a similar paired location is substituted. Once online, the dataset is ‘patched.’ connecting old information with new. Brown, italicized text is used to indicate substituted data. NEWA also uses paired station data when sensors on the primary station fail to report. Sometimes a weather unit is functional but something important like solar radiation malfunctions. Paired station data is substituted for only that sensor while all other data come from the primary instrument. To view paired station information, scroll to the bottom of any hourly or daily data summary and click more information. This entry was posted in FAQ, reports, weather stations, weather summaries and tagged data, paired, sister, station, substitution on March 19, 2018 by Dan Olmstead.